After conceptualizing the lifecycle model and the design rules for reuse, DDI-C content was distributed to the schemas comprising DDI-L. Specific mapping of objects from DDI-C to DDI-L brought to light a number of specific issues which were then addressed during DDI –L revisions. While specific objects may not always have a specific 1:1 correlation in 3.0, the content of all 2.1 objects has been captured, often in greater detail or a more consistent manner than in earlier DDI versions. During the development of DDI 3.2 changes were made in DDI-C to incorporate more content from the Generic Statistical Business Process Model (GSBPM) and to add objects that would ease the translation of DDI-C into DD-L. These objects were also added to DDI-L if not already present. Citation – This structure is used for both DDI content citations and citations for external materials. Coverage – Temporal, Topical, and Spatial coverage map to content coverage dates, subject and keyword topics, and geographic coverage elements. They are held separately in DDI-L in order to allow coverage constraint for modules within a single StudyUnit or Group. Location Specific Information – Some information such as acquisition date, call number, local identifiers, etc. are related to a specific holding and are therefore located in the ArchiveSpecific section of the ArchiveModule. This facilitates packaging for transfer and incorporation into a different archive. GSIM provides a standardized set of information objects that flow through the process model in the creation of official statistics as represented by the Generic Statistical Business Process Model (GSBPM). GSBPM has been of interest to DDI since in conception. The DDI Generic Longitudinal Business Process Model (GLBPM) is modeled on the GSBPM which itself was informed by the DDI Lifecycle Model. DDI has worked with the UNECE in the development of GSIM to ensure that these two standards are compatible. In general, GSIM is a conceptual model whereas DDI is an implementation model. There is a shared interest in ensuring that DDI-L can be used as a means of implementing the GSIM conceptual model. Mapping work and the development of DDI profiles to support GSIM are taking place within that community. A primary area for close mapping to the GSIM structure lies in that areas that relate to their reflection of the ISO/IEC 11179 Data Element Classification Structure. The terminology for the objects as well as the documentation for the objects reflects the GSIM model. 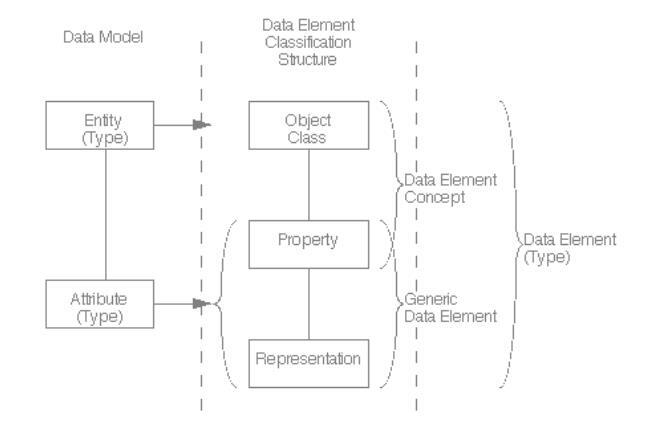 This standard describes the structure and content of a data element as the basic building block of information. DDI -L is particularly concerned with providing the information needed to populate an ISO/IEC 11179 data element and support a registry structure. The following diagram provides the Data Element Structure. In DDI terminology, the Object Class is defined by the universe, its Property is the concept, and the Representation is the Representation content used by the Variable that measures it. ConceptualComponent contains Universe and Concept definitions while Representation is described within the Variable. In most DDI instances it is the Variable that ties the three sections of this definition together. Note that if the Variable does not include a concept reference the instance is not compliant with ISO/IEC 11179. DDI-L reflects ISO/IEC 11179 structure in several respects. First, it maps the core structures Concept, Universe, ConceptualVariable, and RepresentedVariable to the ISO/IEC 11179 Data Element Classification Structure. The structure presented in DDI 3.2 aligns with the representation of this ISO standard through the GSIM structure. (See GSIM discussion within this section). Secondly, DDI-L has adopted the combination of the Agency, ID, and Version as the full unique identification of an object. This is reflected in the identification model and content of the DDI URN. Finally, DDI-L has incorporated the ISO/IEC 11179-5 structure of providing a Name, Label, and Description for all primary objects (maintainable and versionable) that are not considered publication structures. Publication structures have complete citation information plus an abstract. The objects with this common descriptive set are those that are commonly managed with registries over time. The use of these fields provides search information for coordinate based search systems and detailed information needed by the geographer to determine the usefulness of a specific data set for geographic analysis. Careful comparison was made between DDI-C nCubes and SDMX structures. In evaluating the structure and application of these two specifications it was concluded that while basic SDMX structures could be described as nCubes, not all nCubes could be described in SDMX. SDMX deals with well structured, well defined data which contains a time dimension. Not all legacy data contains well structured and well defined aggregate data and nCubes provide support for these structures. SDMX contained a more flexible approach to attaching information to regions of cells within the matrix and used a standard attribute structure to define all aspects of the matrix from the label to the cell content. SDMX requires the data cell content to be within the structure while DDI nCubes allow for the separation of metadata description and data content. In DDI-L the NCube structure retains the specified objects for Label, Universe, Dimensions, and Measure but adds the Attribute object and the ability to define regions of the matrix and to attach attributes to these regions. DDI-L NCubes were designed to map to both earlier nCube structures and to SDMX providing support for using SDMX as a data transfer or storage structure. METS is a standard developed as an initiative of the Digital Library Federation and provides a consistent outer wrapper for digital objects described by a variety of METS profiles. The METS structure was consulted in developing the structure for the Collection and Item objects in Archive and the intent is to write and register a METS Profile for DDI. PREMIS is a common implementation of Open Archive Information System (OAIS). There is a preliminary mapping of DDI-L to PREMIS objects. The focus of PREMIS is preservation and there are several elements where DDI-L does not provide controlled content. However, with the ability to publish controlled vocabularies external to the DDI specification, we should be able to address all but a few of the PREMIS objects. Further alignment with OAIS requirements as expressed in PREMIS and other preservation will take place as DDI-L expands into process models, provenance, and archive management content.